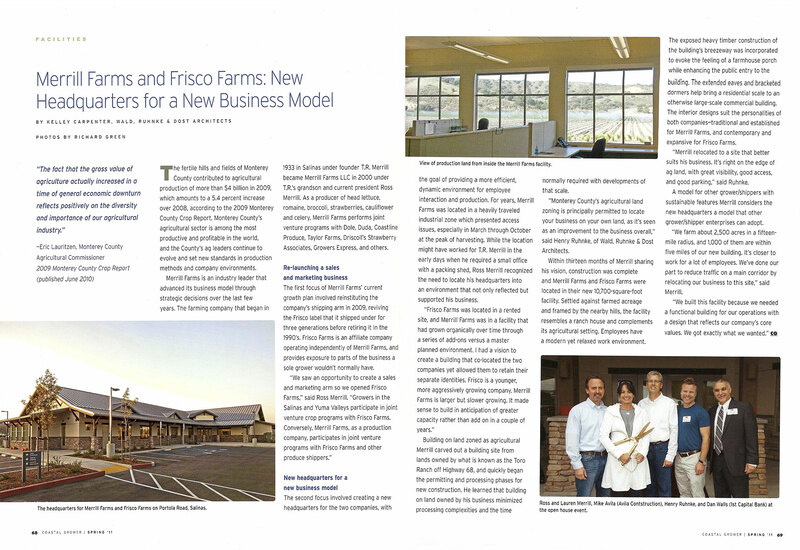 WRD Architects’ design for the new Merrill Farms headquarters facility in Salinas enables two distinct yet complementary companies to operate under one roof: Merrill Farms and its affiliate Frisco Farms. The structure suits its agricultural setting: the exposed heavy timber construction of the entry breezeway evokes the feeling of a farmhouse porch and enhances the public entry to the building. The extended eaves and bracketed dormers help bring a relaxed, residential scale to this corporate headquarters. Stone accents, along with the standing seam metal roof lines, further define the building’s agricultural style. WRD created a distinct look and feel for each company: a richer palette for the more established Merrill Farms, and a lighter, contemporary color scheme and design for young and growing Frisco Farms. The combined finished space includes 25 workstations, 9 executive offices, 2 conference rooms and a 16-seat multipurpose room.